It’s no wonder that speakeasy-style bars have become one of the hottest trends in nightlife. The long lines, loud dance floors, and glaring neon signage of typical clubs and bars can seem cheesy and dated in comparison to an underground, password-required lair hidden behind a secret set of doors. The speakeasy has it all. It gives revelers a sense of history and maybe even a feeling of naughtiness. Perhaps more importantly, it offers bragging rights for those who love to find hidden gems. 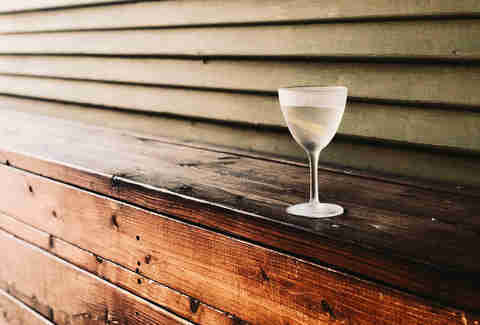 They are also almost always home to a robust, old-school cocktail program serving creative drinks utilizing the favorite spirits of the Prohibition era: gin, bourbon, and rum. 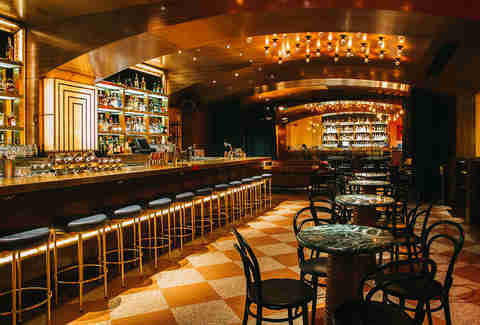 Not to mention, if you’re trying to wow your friends or make a seriously cool first impression on a date, a visit to one of these speakeasy-style bars is a no brainer. This bar is so literally a speakeasy that it resides behind a door adorned only with two small letter A’s, surrounded by dumpsters, in the alleyway that runs behind Henry’s Majestic (an upscale gastropub, which is actually connected to Atwater). It is truly the TARDIS of speakeasy bars. 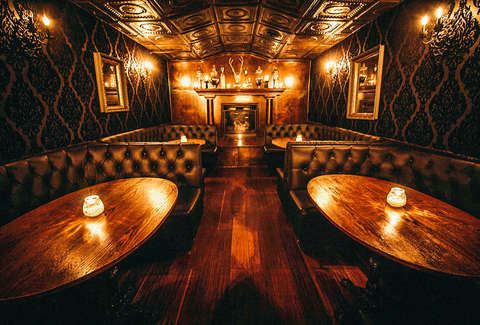 Once you enter the oh-so-easy-to-miss door, you are immediately treated to the sight of a dark wooden bar, lit primarily by candlelight and hanging lamps, serving some of the most delicious and crowd-pleasing cocktails in the city. While the bar initially started with no menu, they now serve cocktails by category like "sour," "spirit-forward," "bubbles," and "Tiki” -- plus a $6 happy hour menu until 8pm. This may just be the Dallas speakeasy by which all others are judged. Black Swan is an unpretentious and dimly lit bar run by award-winning cocktail mad scientist Gabe Sanchez. An early cornerstone in the rebirth of Deep Ellum, it is beloved in large part for its attention to each individual patron’s palate. Don’t believe us? Just saunter up to the bar and let the bartender know what you like (and don’t), then be amazed when they deliver one of the best cocktails you’ve ever tasted. A cornerstone of the newly reopened Statler Hotel, Bourbon & Banter not only captures the spirit of Prohibition-era speakeasies but also the glamour of the 1950s and 1960s, when the hotel was a destination for visiting film stars. 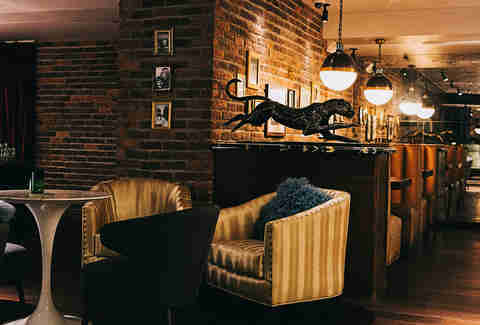 Housed underground, in what was once the hotel’s hair salon, Bourbon & Banter brings an equal share of old-school sophistication and perhaps a few friendly ghosts. In keeping with the historical roots (pun intended) of the space, all the cocktails are named after hairstyles of the time, such as the Pompadour, made of bourbon, Venezuelan rum, bitters, vanilla tincture, and served with a brulee top. 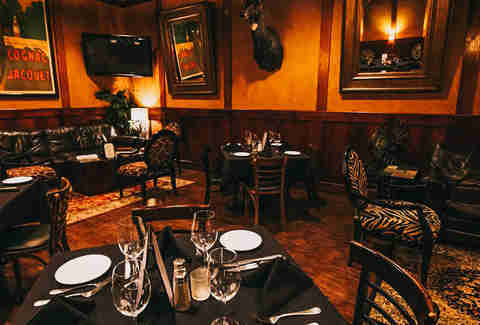 While the dining area of Chamberlain’s Steak and Chop House is just a traditional, high-end steakhouse, it's when you ask to go inside the Cigar Lounge that things get much more interesting. Dinner and drinks can both be enjoyed in the “secret” room, as well as the finest that their humidors has to offer. 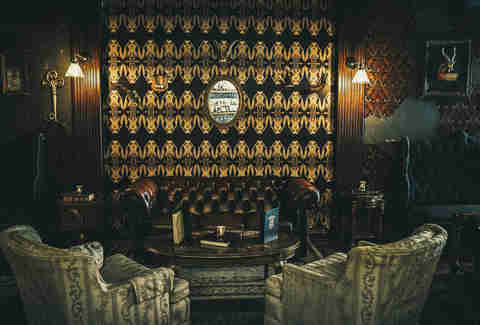 And in true speakeasy fashion, the Cigar Lounge offers membership, which includes access to its private dining room as well as perks such as an individual cigar locker with engraved nameplate. What better place to house a hidden bar than inside an old-school barbershop? Not only does High & Tight cater to its straight-razor-shave loving clientele, it also has an unabashed love of the Prohibition era. Their cocktail menu nods to the time of contraband booze runners and giving the feds the slip -- no, really, the entire menu is illustrated with historical photos of bootleggers and tipplers -- and the 1920s-inspired drinks incorporate Prohibition staples such as sloe gin and one of the best selections of rye whiskey in town. Located in the basement of the ultra-ritzy Joule Hotel, Midnight Rambler wears its love of Prohibition-era drinking holes on its sleeve. You notice that immediately when discovering the somewhat hidden staircase leading underground, marked only with the word “cocktails,” that leads to a dimly-lit space (save for the retro lighting surrounding the ornate bar). 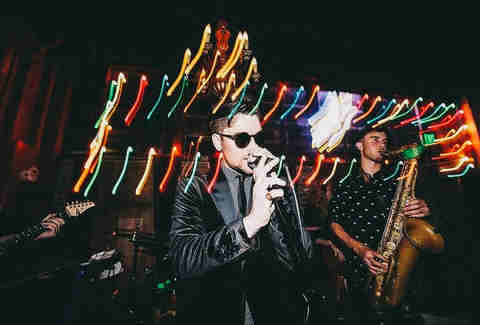 The basement confines feature DJs spinning classic soul and psychedelia on most weekends, which attracts a see-and-be-seen crowd ranging from hipsters to stylists to the rich and famous. With a vibe that is equal parts mysterious library and whispered-about underground lair, Thompson’s Bookstore, located in the historic Vybek Building in downtown Fort Worth, is the most accurate speakeasy experience available in the Metroplex. In keeping with the spirit of speakeasies, Thompson’s has a particular fondness for bourbons, which shows in their wide range of the brown stuff that includes local favorites as well as higher-end offerings. As the only Prohibition-style bar in downtown Fort Worth, it’s also a popular location for private parties, so it’s always a good idea to check the bar’s social media before heading out -- to confirm that it’s open to the public and find out the password for that evening. The most youth-oriented and "hip" entry on this list, Truth & Alibi utilizes a candy shop storefront (titled Deep Ellum Candy Company) to weed out who does and doesn’t get past the discerning door staff. A password, which can be found on the bar’s Facebook page, is also necessary for entry. 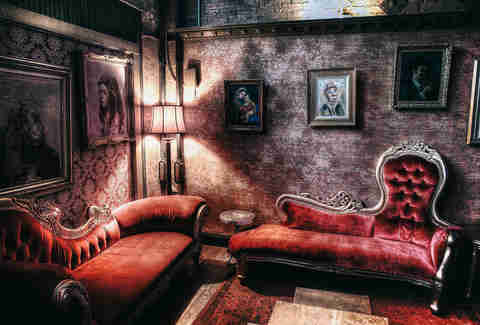 The interior has a modern feel compared to other speakeasy-type bars in town, more club and less clandestine. Bottle service is also available, making Truth & Alibi a perfect marriage between the secretive speakeasies of yesteryear and the newer nightclubs of today. While not strictly a speakeasy, this laid-back bar is a tribute to the speakeasies of New Orleans. Its decadent and cavern-like interior, with deep crimson wallpaper absorbing the light of large brass chandeliers, combined with the constant stream of live New Orleans jazz bands definitely gives the space a Prohibition-era feel. Get there early to lay claim to one of the red leatherette semi-circular booths for prime people-watching and a view of the lively bands and dancers who occupy the floor. With only a small, discreet sign to distinguish this anonymous brick building from the flashy joints on this popular strip of Magnolia Avenue, The Usual features dimly-lit nook booths in a space so ambiguously elegant yet industrial that you’ll wonder if it does double duty as a regular storefront by day. Brought to you by the same team that owns Fort Worth’s destination dive bar, The Chat Room, The Usual is like a grown-up version and makes the perfect location for a Cowtown date night. 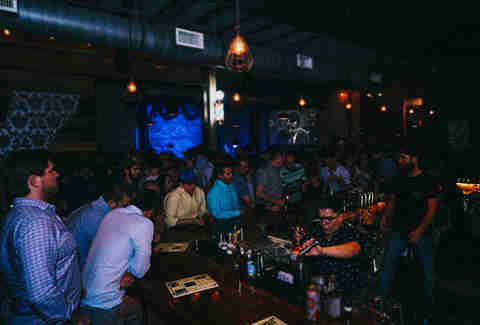 The bar is credited with bringing the craft cocktail movement to Fort Worth and features a menu of Prohibition-era classics like the Aviation and Negroni, or ask your bartender to whip up something custom for you.